Revise GCSE Music: includes detailed info, audio samples and practise questions. 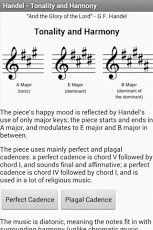 It is built by music tutor, Andrew Hall, this app is the first in a series which will cover each of the areas of study for Edexcel GCSE Music. 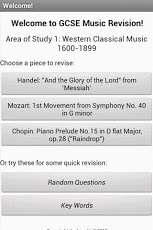 This app covers Area of Study 1: Western Classical Music 1600-1899, including the works by Handel, Mozart and Chopin. 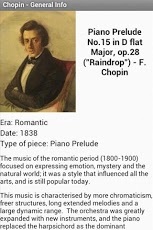 It features detailed analysis of the music itself, including melody, harmony and rhythm, as well as the context in which each piece was written. 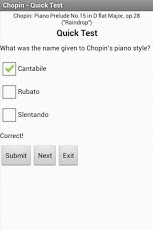 For each of the set works there are midi-audio examples of key melodic and harmonic characteristics, and a selection of multi-choice practise questions. 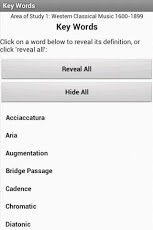 There is also a glossary of keywords for this area of study, as well as the option for a test of random questions from any of the pieces. AoS 2, 3 and 4 coming soon!